Akshay Kumar cannot hold his love for Bhumi Pednekar in the new song of his upcoming film 'Toilet: Ek Prem Katha' which was released today. Akshay Kumar took to his official twitter handle and released the new romantic song titled 'Hans Mat Pagli'. In the song Keshav (Akshay Kumar) is seen doing all those things that an Indian lover does for his love. He chases her, takes incessant photos of her, and waits outside her house, among other things. Love is in the air! Just like any other girl, Jaya realizes this but Keshav continues his romance. There is no dialogue in the song but we can be certain that this wooing eventually was successful because in the trailer which was released earlier they got married. The song is composed by Vicky Prasad and playback sung by Sonu Nigam and Shreya Ghoshal. Just recently the trailer of 'Toilet: Ek Prem Katha' was released which was received well by the audience and was applauded by his fans. 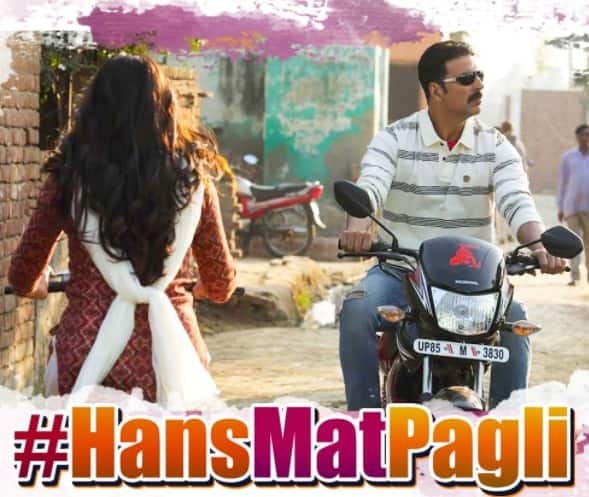 Now the simple and sweet song' Hans Mat Pagli' is also doing rounds on the internet. 'Toilet: Ek Prem Katha' is a movie about Keshav who fights to install proper sanitation system in his village when his wife Jaya leaves him because she has to defecate in the morning out in the open with other women of the village. Keshav goes against his family, villagers, their superstition and fights against the corrupt government. Clearly the film is a subtle take and support of Prime Minister Narendra Modi’s Swachha Bharat Abhiyan. Directed by Shree Narayan Singh, 'Toilet: Ek Prem Katha' is scheduled to release on August 11.